If for whatever reason that music player fails to load, you can listen to Permafrost at its soundcloud.com/_type page. And I’m Marc Weidenbaum; I have run disquiet.com since 1996, and have written for Nature, Down Beat, newmusicbox.org, weallmakemusic.com, Stereophile, and other publications; I live in San Francisco. The conversation will play out in this post’s comments section, below. A little note on the MP3 Discussion Group format: This is by no means a closed conversation, so do feel free to join in. The initial posts by participants were all written before they had an opportunity to see each other’s take on the release in question, but after that it’s intended to play out in real time. More on Thomas Köner and Permafrost at typerecords.com. These reissued early works of Köner, for me, transcend facile genrefications involving tags like ‘minimalism’ and ‘lowercase’: deep earthy sounds of primordial being, like “Nival” from Permafrost, to more industrial almost sci-fi nightmare inclined soundscapes, e.g. “Meta Incognita” from Permafrost, again – surely the consummate drone album of the last decades, Köner’s music is a sort of ethnography of extreme low-end and an enquiry into the boundaries of textural incertitude and accidental harmonics. In fact, what this often feels like, for all its composed nature, is the chance music of the earth itself – organic excrescences, the sonics of the chthonic – tectonic shift, lava surge, ice floe-mo. “Isolationist” certainly, but somehow, despite all these obvious arctic resonances – underlined and bolded, somewhat literal-mindedly, by the new artwork – and, yes, many of the names are foreign language versions of words to do with snow and ice and arctic tracts – and all the epithets expended on describing its ‘sound-feel,’ y’know all of that ‘glacial’, ‘polar’, ‘chilly’, ‘desolate, ‘bleak,’ etc etc, what I’m struck by is the extent to which its deep warm bass tones and ear-fondling filtered soft noise are alluring, inviting, seductive – its affect/effect far from the gloom-mongering of the myriad dreary denizens of doom crouched miserably nihilistically under a stylised black banner clumsily rendered ‘Dark Ambient’. With Permafrost, Thomas Köner makes a definitive statement of what can be done with softened and pitched white noise, reverberation, and virtually nothing else. By listening to the earlier recordings in the trilogy you can hear how he gradually smoothed and refined his process: eliminating sudden grating sounds and disguising all the audio sources (gongs in various resonant chambers, we are told in the accompanying notes). He did the job so well that it almost feels like a violation to start cluttering it up with language. He gave us a title, Permafrost, and presumably approved the adjacent photo of a polar wasteland, but those cues seem mundane given the otherworldly absence of reference in the sound. I used the term “white noise” and we can disagree as to whether it’s in fact pink or brown or even noise at all, since it carries so much information within its echoing layers of rising and falling amplitude. The work suggests the efforts of a painter such as Barnett Newman, who used broad expanses of pure color to invoke the sublime, mingling pleasure and a kind of primordial terror. Newman resisted other interpretations of the work, famously refusing to be included in a Whitney Museum show of “geometry in art.” His ambition was to embody pure sensation. Whether he achieved that goal, or whether his paintings were susceptible to earthly corruption when used as lavish home decor, is another matter. He had problems Köner doesn’t have to concern himself with, in that paintings are physical “containers” and can be considered and criticized as such, whereas Köner’s sounds fill the room and listeners are much more willing to suspend disbelief that the speakers can be separated from the art. Köner’s “containers” are language, and what uses can be made of this music. We know it could be a soundtrack for a film like Kubrick’s 2001 or a Cronenberg vehicle but perhaps not the upcoming remake of Gilligan’s Island. We are told it is part of a genre that includes the word “dark.” Is it truly dark or is it majestic, unconcerned with the lives of human termites? The underlying gongs are instruments of pomp and ceremony, meant to introduce the arrival of great personages. Perhaps we can say that Köner’s godlike drones combine aspects of nature (the afterboom of falling rocks in canyons), culture (auditory regal symbols), and technology (showcasing modern sound production technique) without massaging them too much with evocative or poetic language. The use of modern sound production technique raises the issue of how the work might be discussed in the history of electronic music. Knowing Köner comes out of the techno subculture one might assume the sounds were generated artificially and “bodied up” in the studio. What do we make of the information that the sounds were generated mostly by “natural” means? I should say in advance that my knowledge about Thomas Köner is sorely lacking. Whether this turns out to be a boon (helping me to focus just on the sounds themselves) or a hindrance (lacking the necessary context to make sense of those sounds) remains the be seen. In any case, all I know about this re-release comes from the Type site. How do you fit something this massive into your listening life? Type’s blurb grabs Köner’s glacial title and goes hog wild: “Its sound is so absolutely other worldly – the creeping low-end rumbles, distant icy tonal blasts and croaking occidental winds – that it contextualizes the record with little else composed.” How am I supposed to get “croaking occidental winds” through noise-canceling headphones in the coffee shop? I decided to take my question and make a little experiment with it: I listened to the album on headphones in the coffee shop, through my little laptop speakers, and through the big speakers in my apartment. The experience was illuminating: Köner’s low-end rumbles become shimmering tonal sweeps through a MacBook’s small frame and start fights with neighbors through a subwoofer. In case this seems unfair—focusing more on the context of the record’s playing than the record itself—blame the record’s economical vastness. The question was not just “How am I supposed to listen to this?,” but “How can I possibly listen to this?” No matter where or through what I listened, Köner’s rumble became a bed for any loud, momentary sound or chorded with any sustained sound. Living in the city (or perhaps anywhere), it is impossible to listen to only this. The sound is so massive (ironically described as “silence” in the Type blurb) that it spills out of its confines, sweeping up any and all environmental sound. Cicadas, coffee grinders, and my laptop’s fan all were incorporated into it. None of this is a knock against the record: I was thrilled by how it made me reassess the boundaries of my listening life (perhaps in the spirit of “ambient”’s Eno origin myth), and on a more basic level, I thought it was quite gorgeous. One last observation before the solipsistic part of this ends: I found the experience of seeing the waveforms in the SoundCloud embed fascinating. Part of the massiveness of this sound (tracks like 5-minute icebergs) is that there are just no “parts” within it to speak of. Listening to the first two records of the triptych, this became obvious: for Nunatak or Teimo, you could mention a particular hit or beat. Permafrost, on the other hand, seems solid all the way through, progressing through frequencies so dense that I found it impossible to pull them apart—there were no footholds. Seeing the waveforms made this both obvious and less threatening: I knew, more or less, what I was in for. I could tell when I should be hearing something. Listening without the visual aid was a very different experience, raising more questions about the source of what I was hearing. And, because I can, one post-last observation: I thought the whole “icy” thing was a bit overwrought, so I tried to imagine, instead of tundras, deathly hot deserts while I listened, and you know, it still sort of worked. It is frightening to contemplate the unravelling of twenty years between the release of Thomas Köner’s Nunatak Gongamur and the present. At the time it was an odd CD, more akin to the albums released by Asmus Tietchens on the same label, Roland Spekle’s Barooni, than to any of the more gently experimental ambient work issuing reliably from the apparently connected label Staalplaat during the same period, and indeed Köner’s name was seen around the same time on Tietchens’ Sinkende Schwimmer. Even today, the more briefly named Nunatak (one wonders what became of its more descriptive second name) juts troublingly out of the smooth snowy surface of the work following it, and there is still little I can call ambient about it, as even the waveforms of the tracks in Type Record’s Soundcloud player graph the strange sonic events across arctic silences. There are the first hints of Köner’s now well-established style here, more noticeably in the sheets of sound swept across the second track, but much here has a concreteness – of instruments played and sounds occuring in a place – not heard on any of the subsequent albums. It is stranger still, then, to consider this album as part of a triptych with Teimo and Permafrost, neither of which retain any of the haunted creakiness with which Nunatak’s sixth track, unfolds its frost-bitten nightmares; for me Nunatak remains unique in Köner’s discography, and it is with the later Aubrite, the final release on Barooni, that these other two have the most in common. But if we look at Type’s welcome reissue series as a charting of Köner’s path to his sound, then this particular trio makes sense, for the jump from Nunatak to Teimo, which I recall describing to a friend at the time of its release as “On Land, frozen,” is enormous, while that from Teimo to Permafrost is small but decisive. From the start Teimo is a different place entirely: gone are the howls and clanks signaling doom to the unwary travellers into Nunatak, and gone too is the percussive play of gongs; only the low frequencies remain, and over these are beautifully glacial expanses of richly harmonic sound, the metallic screeches appearing now only distantly. As with Nunatak, my early impressions remain of Teimo: if it embraces Brian Eno’s Ambient 4 aesthetic in establishing an inescapeable sense of place, then that place is preserved beneath a mile of ancient ice. 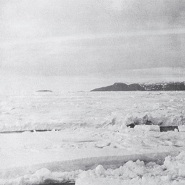 At the heart of Teimo, for me, is Andenes, the longest of its icefloes and the clearest assertion of distance from Nunatak; the sounds are familiar enough from the previous record, but now they feed into the greater subharmonic drone. By the closing Ruska, the gongs seem more like singing bowls, ringing delicately into the white-out distance. By Permafrost, the waveforms again tell the tale: the attack and decay of gongs is completely gone, and only the drone remains. The music is abstract, without origin or reference, the abyss opens beneath. And strangely it is here that in retrospect one feels most comfortably at home, for it is here that Köner’s style is found in full flower, and here too is the template for much else to follow; could Sleep Research Facility or Amon or Hazard, to name three of the most fruitful practitioners of this dark droning ambience in the last decade, have been built on anything other than Permafrost (with perhaps a bit of Heresy added for good measure)? But more curious for me, having played Svarte Greiner’s Penpals Forever (And Ever), a record on Digitalis by a man with numerous releases on Type, just prior to listening to these three by Köner, is the proximity of this grim item and its Type-released kin not to Permafrost or Teimo but to Nunatak, and perhaps by the release of these records as a trilogy Type is tracing not only Köner’s roots but its own, back to the late 1980s and the so-called ambient industrial music of that period, to Core and Cranioclast, to The Hafler Trio and Zoviet-France. But these records are not mere origins, mere early works, mere antecedents; they remain as powerful, as beautiful, and as memorable as they were upon first release. I only wish that my headphones could do them justice, as did the incredible soundsystem at the late lamented RML space in which Köner performed several years ago when he came to SF. Permafrost is exemplary of what recorded music can be because of the rise of the CD player and, later, the un-mechanical virtues of the flash-memory-based MP3 player. It’s sound that takes full advantage of the increasingly pure tabula rasa that the past 25 years or so have provided to engineers and musicians, not to mention listeners. Given how extreme quietness is more commonplace than ever in music today, it’s essential to keep the year of Permafrost’s initial release, 1993, in mind when listening to it (much as I’ve long held that science fiction novels, especially reissues and reprints, should put the year of their initial writing/publication next to each page number, for mental orientation). The starkness of the material makes it feel like an extreme extrapolation of early (1970s) ambient music, and the more I spend time with it, the more I find myself seeking out circumstances to best appreciate its charms, such as they are. It’s been a permafrosty summer here in San Francisco, the coldest since 1971 by some accounts, so the sky is gray and the trees nearly birdless; this album may, unintentionally, be the perfect summer soundtrack. Still, just the sound of Teimo was enough for me to find it cold; inviting and comforting, yes, but not exactly toasty. And I must admit to running my space heater while listening to these records on headphones in the dark, the silence outside punctured by foghorns. Thanks, Joshua, for the context. I agree that the packaging is both beautiful and expectation-setting: it’s hard to not hear this as if you’re out there on the ice. The question for me is less about whether the sound itself is “cold” or not (I’m trying agnosticism on that), but how significant we consider all this surrounding “paratextual” material. Yes, the new cover is icy, but so are the titles. I guess my concern is why we feel the need (and I do, too) to try and extricate the sounds from their context, as if that would let us know for sure whether they are “really” cold. Indeed, that’s absolutely right – without Köner’s work I wouldn’t have seen music the same way. I remember acquiring ‘Permafrost’ in the late 90s and letting it re-define the way I heard ‘ambient’ music at the time. That sense has never really left me, and it was a pleasure to release these records on a personal level as well as releasing them to get to other people. Nice to see some other people feel the same way about these works, they’ve been out of print for so long that you never really know. I always found it odd too that Mille Plateaux only re-issued two of the three… I think hearing them as a set is incredibly revealing and important to the ‘whole’. Thomas envisioned them as a triptych (rather than a trilogy even), and always wanted them to be released together. In relation to some other comments about the artwork, these were related to Thomas’s ideas of the narrative too – ‘Nunatak’ having human contact, ‘Teimo’ with water and ‘Permafrost’ having ice and no trace of humanity. He mentioned to me that the Arctic thematic content was merely because that was as alien a place as we could get, here. I think taking it further, making it more obviously ‘sci fi’ would have probably been too far. Hi, John — thanks for having weighed in, and shared not just the way Köner’s music informed Type’s development, but also the decision-making behind aspects of the release. (For readers of this discussion who aren’t aware of it, Twells is the co-founder of the Type label.) Arctic-as-alien makes sense; I’m gonna go off on a wholly different arctic tangent shortly, but am pondering the alien (loving the alien, as Bowie put it) at the moment. I prefer the original Permafrost cover that Joshua linked to. You have the word “permafrost” but surrounded by all this ambiguous granular material. The mind has nowhere to go and doubles back into the music (instead of trying to think of additional nature metaphors). I don’t think the music is cold at all–it’s full of life, although possibly not life we know. Alan, will definitely be skulking around your semiotic cavern in due course – thanks for the link! I used the phrase “otherworldly absence of reference” without having seen your essay, Alan. You say it well in albient post: “Cartoon gloom and doom-mongering does occur, but many of these works reside in an indeterminate zone of unresolved meaning potential. The â€˜dark’ element would seem to be essentially an amplification of the aspect of Otherness that reveals itself in the world when it is experienced stripped of its veneer of rationalized familiarity. The music evokes aspects of the world as individuals have not experienced them before, e.g. subterranean / underground / underwater, in such a way that it is like hearing and sensing one’s environs for the first time, not processed through the sanitizing perceptual slant of the domestic/institutional lens, and hence sounding perhaps somewhat ominous, threatening, or fearsome in its unalloyed primevality. It is not the real world of here-and-now but an imaginary world of Otherness. Elsewhereness.” That’s great. Yeah, nice serendipity that you used that phrase “otherworldly absence of reference” without having seen my essay. I think we’re more or less on the same wavelength on this, but, to be precise, I think my point – in the essay, and in the Oophoi review I linked to – was part of an argument against ambient music (which was the object of my semiotics-influenced study) having some kind of fixed over-determined reference (e.g. sacred, spiritual, etc), and not that it was characterised by an ‘absence of reference’ as such. I recall someone describing Eno’s music as ‘ambivalent’ (or was it ‘ambiguous’? ), and thus not really suited to functioning as a mood-configurer to serve as a sort of new form of Muzak – as, for example, Music for Airports could never function as its name suggested it might, as its lack of a definite resolved mood was too prone to passing unwanted interpretations, e.g. could be ‘troubling’, ‘unsettling’, when ‘calm’ and ‘relaxed’ was what the airport managers would want people to be feeling. Anyway, not to drone on inordinately on this, I just wanted to point to the open-endedness of interpretation one might make in relation to its fundamental ‘otherwordliness’. Put simply, I don’t think it’s referring to nothing (a la Roach’s The Magnificent Void?! ), it’s that I think it isn’t necessarily referring to something definite – some inevitable-always-signified, and is thus amenable to different significative journeys each time. Knowwhaddamsayin’? Well, I did follow the “otherworldly absence of reference” phrase with a statement about Permafrost being full of information. I don’t think this recording, or Newman’s paintings, are about nothing. The absence refers to the inadequacy of linguistic equivalents rather than an absence of content. I think we’re agreeing that’s where the “otherworldly” comes in–that that word, at the very least, is one we could use to describe something taxing the limits of language. Until La Barca last year (see its beautiful, appropriately smeared & otherwordly video at http://thomas.koner.perso.sfr.fr/labarcavideo.htm), I only knew Köner as part of the sometimes tasty but generally not so exceptional Basic Channellers Porter Ricks. When your entry point to a body of work as long-running & evidently influential as his – great to get John’s take on its resonance for him, by the way… – is as tangential as that, it takes chutzpah or a deep breath to start in on it. It’s a pretty austere reduction, & a pretty compelling one once you accept how limited the palette is & little interested the music is in notions of variety. It may not grow on you so much as into you! So I recognise & echo Tom’s comment that it “almost feels like a violation to start cluttering it up with language”. A music so far beyond a standard musical vocabulary certainly makes little room for other languages. But of course that’s not to say that there’s nothing to say about it – only that its slab-like immensities can at times make words seem somewhat over-cooked (certainly my overwrought ones!). PS Anyone know Kontakt der Jünglinge (http://www.koener.de/kontaktderjnglinge.htm), by the way? That’s one Köner collab I’d relish getting to hear…his ‘digital opera’ (http://www.vancooten.com/blog/?e=231) is another, even if it’s not quite collaborative in the same sense. Julian, I really like the terms you’ve got here like “austere reduction” and “slab-like immensities.” One of the things I had intended to remark on in my original response was how, when I listened through the speakers in my apartment, the sound seemed to fill all the acoustic negative space. Its “otherness” meant that it didn’t really compete with other sounds so much as completely surround them and absorb them. Part of the reason I think it’s hard for people to get much deeper than this question of coldness or otherness is the record’s limited variety. If I wanted to dig into a particular track, what could I even talk about? I couldn’t point you to any one moment, and, although the sounds develop over time, I don’t know that there is much to say about that development in and of itself. For some reason, it seems like the only thing to do is to talk about these tracks as irreducible units, and that is quite an accomplishment on Köner’s part. He’s managed to produced such durable and simple pieces that they not only “make little room for” language, they seem to totally evade it. Of course, this might just be the lazy critic’s approach—someone should make another effort at taking the ice-ax to Köner’s sonic boulders. long neglected among the Barooni releases, the snow-bound feeling remains, and one almost feels that those cars in Peripheriques 1 have “In My Car It Is Snowing” bumper stickers. But I want to specify that this distance in Köner’s music is not a formal or analytical one. In contrast with the austere and detached work of Tietchens in the same period, Köner’s work from the start has been emotional engaging; we may not be Here in his work, but we are somewhere and feeling something (as with a completely unlikely soundtrack on our headphones – from personal experience, Love’s Secret Domain by Coil while being harrassed by angry drunks on the northbound IRT local in Manhattan – while out in, or out of, the world). And perhaps it is in what I want to call a strange sense of yearning – as if based in false memories of impossible places – that I can locate the continuing appeal for me of these records. I love how stymied we all seem by this record. It really is a testament to something—a less consistent work (like even Nunatak) opens itself for critique in ways that just seem to slide off of Permafrost. The question this raises for me is: What if there was another record very similar to this, but with difference swells and frequencies? Would I then have more to say, or would it be qualitatively indistinct from Permafrost? Try Sleep Research Facility’s ‘Deep Frieze’. It seems pretty close to Permafrost to me, yet sufficiently distinct. Could your little experiment be carried out with this one? Then perhaps we can discuss what substantively distinguishes Thomas K from these self-styled Dark Ambient merchants. which takes the cold and the crackle (far-flung Australian musical reference unintended) of this trilogy to a different place entirely, using very different means while hitting some of the same displaced referents. And speaking of Lull, what of the Murder Ballads trilogy, on which Lull (aka MJ Harris) brings the drone and Martyn Bates (of Eyeless In Gaza) narrates grim stories, or Brian Evenson’s album with Xingu Hill and Tamarin, Altmann’s Tongue, on which the former tells his tales over the gloomy beds of sound provided by the latter two? How does the addition of narrative change the way in which we hear the sonic undercurrents? Isn’t there something suggestively Protean about this sound? The “stymied”-ness that Nick references, and the “inadequacy of linguistic equivalents” that Tom just mentioned, hasn’t kept us from poking at this strange and wonderful beast of an album. Quite the contrary, it entices us through its staidness, the wallflower that garners more attention than the bride. What a great discussion. Thank you, all. The more I listen to Permafrost — something I hadn’t done in many years in advance of Alan having suggested the record for this month’s discussion group — the more the frozen-ness, the imagery sonic and visual and linguistic, comes to focus my imagination on the stasis of the music. As always for me, two descriptions come to mind, the “vertical color” of Eric Tamm’s book on Brian Eno, and the old Godflesh industrial-metal phrase “Avalanche on pause.” What is frozen, to my ear, in Permafrost is less a matter of emotion (as I think most of the people assembled here would agree, the album is beautiful despite its initial appearance of remoteness, perhaps because of that remoteness) than it is of time. Time is what gets slowed down, even put on hold, on Permafrost: music slowed past placidity and into a stasis that’s more a matter of concrete than feathers, the sort of timelessness that CS Lewis (a third significant touchstone of atemporality for me) talks about in some of his depictions of heaven in The Great Divorce. It’s time frozen still, and rendered hard as a result, crystalline surfaces explored compositionally. The music is a kind of flight simulator through the textures of tonality. What an enlightening discussion! “Permafrost” was my first introduction to Könerâ€˜s work while acquiring “Teimo” and “Nunatak Gongamur” came somewhat later. However, if my memory serves me correctly, it was listing to Brian Williams (Lustmord) that gave me my first exposure to the isolationist, dark ambient genre. Reading the comments inspired me to go back and relisten to this triptych in sequence (as well as dig up some CDs by Lustmord, Lull, Sleep Research Facility, Gustaf Hildebrand, Hazard, Tom Heasley and others that had been stored away in a trunk for way too long). While in my mind “Permafrost” does the best job of the three of reflecting sonically the ideas and fearful awe that I associate with artic landscapes, “Nunatak Gongamur” haS a strong appeal to me because of its seemly more primitive/primordal atmosphere (may be because of more space between the sounds, less processing?). Anyway, thanks to all of your insightful comments, my interest in this genre as been renewed.